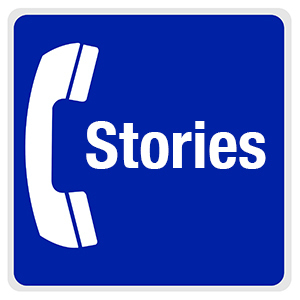 We will preview our new storytelling system, including a special truck, at the 40th-annual Adams Morgan Day on September 9th. Find us in the “Know Your Neighborhood” section. This is the first public showing of our Humanities Truck, an experimental recording and exhibition space on wheels from American University. The truck will distribute digital and interactive stories on historic Adams Morgan from the Smithsonian Anacostia Community Museum’s “A Right to the City” exhibition as well as photographs from the long history of the festival itself from the Nancy Shia Collection, Washingtoniana, DC Public Library. WASHINGTON, September 4,2018 —To honor the 40thAnniversary of the Adams Morgan Day Festival, a series of activities to “Know Your Neighborhood” will be featured at the event. Festival visitors can learn about the neighborhood’s past by viewing photographs at the new “Humanities Truck,” listen to oral histories and watch live interviews with neighborhood activists Marie Nahikian, Topper Carew, and Ronald and Mary Pierce. The content of these activities planned as part of the festival is drawn from several recent exhibits and projects, including the Smithsonian Anacostia Community Museum’s “A Right to the City” exhibition about neighborhood organizing, and historic photos spanning 40 years of Adams Morgan Day festivals from DC Public Library’s Nancy Shia Collection. 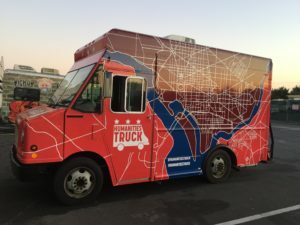 The event will also launch the Humanities Truck, an experimental recording and exhibition space on wheels from American University that can share neighborhood history in new ways. Several local groups are coming together to highlight the history of Adams Morgan through exhibitions, activities, voices and performances. The coalition includes the DC Public Library, Smithsonian Anacostia Community Museum and American University. “In honor of the decades of creativity, activism and diversity of Adams Morgan that continue to shape the community today, we thought it important to engage the public with historical resources and activities at the city’s longest running neighborhood festival,” said Michele Casto, special collections librarian at DC Public Library. “This is the first public showing of our Humanities Truck, with our storytelling system to bring history into public streets,” said Dr. Benjamin Stokes, assistant professor in the School of Communication at American University. The truck combines large screens with public programming, including a playful activity for festival attendees to visit key locations and text a hotline to receive historic photographs and learn about the sites. DC Public Library is celebrating the culture of the neighborhood and the city by sponsoring some of the performers on the festival stages and at space adjacent to the Humanities Truck. This “Know Your Neighborhood” stage will highlight the Latino heritage of the neighborhood through music, dance and storytelling, and also feature live on-stage interviews with significant Adams Morgan activists of the 1960s, ‘70s and ‘80s. “The Library has been engaged in ongoing initiatives showcasing local music and neighborhood history and we are excited to work with partners to bring music, dance and storytelling to Adams Morgan Day,” says Casto. The Columbian rhythms of La Marvela, the poetry and storytelling of Quique Aviles, and the dancers and drummers of Vava United School of Samba will perform. Hola Cultura,a D.C. Latino arts and cultural nonprofit organization,will join the Library to offer tours highlighting the Latino history of the neighborhood. The Library has also partnered with festival music organizer Songbyrd Music House, Smithsonian Center for Folklife and Cultural Heritage, and Multiflora Productions to sponsor music that reflects Adams Morgan as a cultural crossroads, bringing global sounds to all the festival stages. The collaborative exhibits and performance space at 18thStreet NW and Belmont Street NW will explore new ways to engage the public in local history. Visitors to the Humanities Truck can see historic photographs of the neighborhood over the years on one of the truck’s screens. Visitors can also win prizes by following the History Map Postcard developed collaboratively by American University and the Smithsonian Anacostia Community Museum. “We’re providing a fun and creative way for people to meaningfully engage with the neighborhood’s rich—but too often overlooked—history,”says Dr. Samir Meghelli, chief curator at the Smithsonian Anacostia Community Museum. Bringing stories of neighborhood organizing and activism from the “A Right to the City” exhibition to the festival is one way the Museum will be continuing its five decades of community-building work. The festival kicks off a larger collaboration that will bring elements of the “A Right to the City” exhibition to DCPL neighborhood libraries this fall. Event plans are listed on the official Adams Morgan Day festival website: http://www.admoday.com, Facebook.com/AdamsMorganDay/and@AdamsMorganDay#AdMoDay18. Planners of the 40th Anniversary Adams Morgan Day Festival announced the music lineup, featuring famed D.C. go-go band Trouble Funk (also celebrating their 40th year), and highlights of D.C.’s longest running neighborhood festival, taking place Sunday, September 9th from 12:00 p.m. to 6:00 p.m. The free event is open to all ages and will highlight the vibrant energy and diverse, creative cultures that define this historic neighborhood. Street Closures on 18th Street NW between Columbia Road and Wyoming Avenue will make way for festival goers enjoying live music and art, neighborhood history exhibitions, expansive youth activities, curated local vendors, restaurant specials and more. Businesses and restaurants along Columbia Road and Florida Avenue will also participate. The Lineup to date represents the rich variety of the local music scene that, in addition to Trouble Funk, includes Adams Morgan Day veterans Mariachi Los Amigos, innovative and soulful DuPont Brass; West African griot musician, Cheik Hamala Diabate; all-female Afro-Brazilian percussion group Batala; Afro-Soul band, Kino Musica; the feel good funk of Joe Keyes and the Late Bloomers Band; indie rock band, Lavender; electronic indie pop band, Atoms Apart; Colombian rhythms of La Marvela; a Big Ugly Truck dance party with DJs Pharoah Haqq, Crown Vic, Vico Vibez and Mezcla; and performances by the divine Ladies of Perry’s. Live entertainment for kids includes award-winning children’s performer and education act The Uncle Devin Show, youth breakdancing demonstrations by The Lab, DJs and more. Songbyrd Music House, DC Public Library, Smithsonian Center for Folklife & Cultural Heritage and Multiflora Productions partnered “to present and sponsor music performances at the festival that represent Adams Morgan as a cultural crossroads,” says Joe Lapan, music coordinator for the event and co-owner of Songbyrd. Celebrating History and Culture: To celebrate the festival anniversary, DC Public Library has also collaborated with Smithsonian Anacostia Community Museum and American University to highlight the history of the neighborhood through exhibitions, activities and performances. “Our goal is to foster an appreciation of what makes communities like Adams Morgan unique, and to honor the decades of creativity, activism and diversity that continue to shape the community today,” said special collections librarian Michele Casto. The Humanities Truck, an experimental recording and exhibition space on wheels from American University, will exhibit Adams Morgan content from Smithsonian Anacostia Community Museum’s “A Right to the City” exhibition about neighborhood organizing, and historic photos of Adams Morgan from the Library’s Nancy Shia Collection. Some photos may be seen now on Instagram, Twitter, and Facebook at adamsmorganday. “We’re thrilled to see the energy behind our 40th anniversary event this year, with triple the number of volunteers since last year and increased support from many local businesses,” said Kara Davis, chairman of the Adams Morgan Community Alliance, a non-profit formed to ensure the sustainability of the annual festival. Activities and Family Fun: “Activities are greatly expanded for all ages this year and include a ‘Family Fun Zone’ provided by Volo City Kids Foundation,” said Alliance president A. Tianna Scozzaro. Volo City will bring certified volunteers and equipment for soccer, flag football and games for kids of all ages. Games include corn hole, connect four, kan jam, jenga and more. Families can sign up for free kids’ sports leagues occurring in Adams Morgan and around the city. These and more family-oriented activities will be located at the newly renovated Marie H. Reed Elementary School and Community Center grounds and adjacent soccer field. The Marie Reed Elementary School PTO is organizing a student arts and crafts sale to benefit the after school program. Festival organizers are scheduling face painters, a juggler and entertainers for youth. Elsewhere at the festival will be exercise classes and demos for adults, including a chance to take a test ride on the Peloton Bike. MINT Gym and Studio will lead free Zumba and “WERQ” classes. Art, Vending and Restaurant Specials: The festival will feature the amazing creative work of local artists, crafters and designers at booths throughout the festival. Local service organizations, local politicians preparing for the November election, and some area businesses will also connect with the community. Back by popular demand will be Artists’ Alley, an interactive space supported by Mellow Mushroom with crowd-engaging live visual arts organized by designer Josue Martinez, who is owner of Corinto Gallery and designed the t-shirt, and branding for the 40th anniversary. The alley will feature art demonstrations, live muralists, graffiti artists and performance art. More activities, and specials offered by many local businesses continue to post on the festival website. How It Happens: Adams Morgan Day started its run as a neighborhood potluck block party, conceptualized in 1977 by five local businessmen. The event grew to attract an estimated 300,000 people some years in the 80’s and 90’s. Scozzaro, Davis, Lapan and Martinez are among a small group of volunteers made up of neighborhood residents and businesses that saved the event from collapse when it was cancelled by former organizers in 2015. In addition to Scozzaro, Davis, Lapin and Martinez, Adams Morgan Community Alliance founders include David Smith, Dave Delaplaine, Carol Miller and Robert Turner. The event is now more representative of the neighborhood and what makes it unique and operates with accountability. Adams Morgan Day is made possible by thousands of volunteer hours, in-kind services and funds provided by committed Adams Morgan residents and businesses, individual donors, community organizations such as the Kalorama Citizens Association and Life Asset, and sponsors that serve Adams Morgan and the Washington DC area. Sponsors this year include Peloton, DC Public Library, Adams Morgan Partnership BID, music coordinated by Songbird Music House and Record Café, sound/stage partnership by Chuck Levin’s Washington Music Center, graphic design by Corinto Gallery, Family Fun Zone by Volo City Kids Foundation with the Marie Reed Elementary School PTO, television sponsors NBC4 and sister station Telemundo 44, and fiscal sponsor DC Arts Center. Partners include Mellow Mushroom supporting Artists’ Alley, and a hydration station by ZICO Coconut Water and Hubert’s Lemonade. Other donors ($500 or more) include Advisory Neighborhood Commission 1C, AdMo Heights, BUL, the DINER, Jug & Table, Roofers Union, Sakuramen, Tryst, Meze, Maven Car Share, MINT Gym & Studio, Soussi, Bedrock Billiards, Himalayan Heritage, Piccolo Properties, epolitics.com Pitchers DC, AT&T, ACCUPERMIT, and Pepco, an Exelon Company. Donations continue to be accepted. 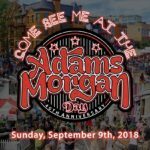 Follow event plans on the official Adams Morgan Day website at http://www.admoday.com, Facebook.com/AdamsMorganDay/ and @AdamsMorganDay #AdMoDay18. Tax deductible individual donations are accepted at http://ioby.org/adamsmorgan.